Keynes College is pleased to welcome the ‘Staying Out’ exhibition that has been installed in the Keynes Gallery (above Dolche Vita). 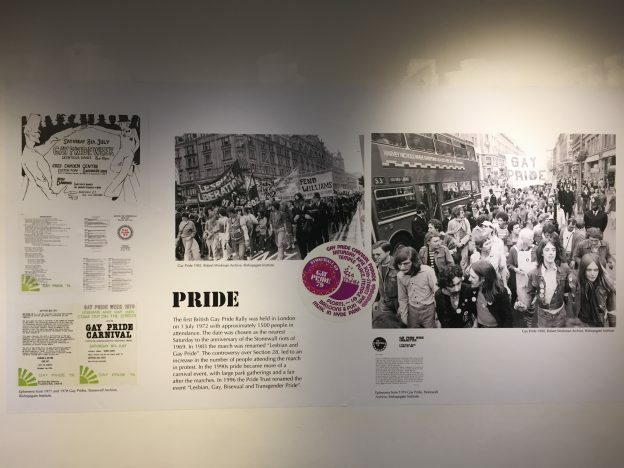 Curated from the LGBTQ archive at the Bishop’s Gate Institute, this exhibition vividly depicts the LGBTQ struggle over multiple decades, around the concepts of “Coming out”, “Protests”, “Pride” and “Equality”. For further information on exhibitions in Keynes College visit our events page. Access the full LGBT+ History Month 2019 programme here. This entry was posted in Campus online, Student Guide on 11 February 2019 by Sophia Cheraitia.